1. Spinal manipulation is here to stay. Why? It’s an effective and efficient way to increase mobility, reduce pain and remediate faulty movements patterns when implemented strategically into treatment. 2. Spinal manipulation dates back thousands of years, but recently the popularization of single modality traditionalist based chiropractors has begun to receive scrutiny in the medical and rehabilitation communities largely for creating dependency along with limited self-sufficient long term results of their patients. 3. Lets be clear, no one profession owns a specific technique. The use of spinal manipulation in the course of treatment and rehabilitation does NOT solely belong to chiropractors. Physical therapists, osteopaths and medical doctors also have not only the skill set, but the scope of practice to use thrust manipulations as an intervention technique. 4. While a stand alone adjustment are less than effective for long term results, the physiologic and neurologic benefit of spinal manipulation is magnified when used strategically as part of a holistic plan of care for patients presenting with pain and dysfunction. 5. Spinal manipulation should be a tool, not the only tool in a practitioners toolbox. Quit wasting your time and money on pre-scheduled pre-determined spinal manipulations as a stand alone treatment. The body needs more than a thrust to change, and movement is usually the missing link. Manipulation is one of the oldest interventions in medicine and has a rich, diverse, and often turbulent history. References to manipulation in the healing arts date back to over 4,000 years ago, with discussions found in Egyptian scrolls (Edwin Smith papyrus) and enshrined in ancient Thai sculpture. Hippocrates described anatomy, spinal manipulation, and the reduction of dislocation and fractures with manipulative techniques, which were canonized in writing of the Roman Physician, Galen (1). The American Chiropractic Association (ACA) defines a manipulation as being multi-faceted. A manipulation is a passive manual maneuver during which the three-joint complex may be carried beyond the normal voluntary physiological range of movement into the paraphysiological space without exceeding the boundaries of anatomical integrity. The essential characteristic is a thrust—a brief, sudden, and carefully administered “impulsion” that is given at the end of the normal passive range of movement. The “dynamic thrust” is the defining factor which distinguishes spinal manipulation from other forms of manual therapy. The thrust technique can be low or high velocity. The most common characteristics of the adjustive dynamic thrust are a controlled force delivered with high velocity, in a specific direction or line of drive, at a regulated magnitude and depth. In short, manipulation is a passive dynamic thrust. Some people use the terms manipulation and mobilization interchangeably. However, there is a difference between manipulation and mobilization. They are two separate techniques. According to the ACA, a mobilization is a non-thrust, manual therapy. It involves passive movement of a joint within its physiologic range of motion. This is approximately equivalent of the normal range of motion a joint can be taken through by intrinsic musculature. Active range of motion is motion which patients can accomplish by themselves. Mobilization is passive movement within the physiologic joint space administered by a clinician for the purpose of increasing overall range of joint motion (2). But Only Chiropractors Manipulate The Spine… Right? The American Physical Therapy Association (APTA) states a spinal manipulation is defined as a high velocity, low amplitude (HVLA) therapeutic movement within or at the end of motion. The APTA states that spinal manipulation is not designated as being under the exclusive domain of any one specific profession or group of practitioners. Physical therapists, chiropractors, medical doctors, and osteopathic physicians are all educated and trained to employ manipulation within the scope of their respective licenses and in a manner that protects the public’s health, safety and welfare. It is inappropriate for one profession to attempt to “own” a specific technique or dictate clinical practice through such legislation (3). I was just talking with legendary strength coach Eric Cressey the other day about this topic discussing how not one particular profession can bogart their preferred modality. I personally appreciate when different professions utilize these interventions like manipulation, acupuncture and dry needling because it creates innovation and further improvement in all of these amazing tools. Each person, each profession is completely influenced by different locations, philosophies, theories, evidence based research, myth and folklore, but I say if it helps your patient or athlete, then keep up the good work! At the end of the day, manual therapy is an art and different professions will paint different pictures. The key is to add value and bring continuous results to our patients and athletes no matter what picture you paint. Based off my chiropractic knowledge and experience, there are plenty of benefits to receiving a manipulation; however, for the the sake of this article, I would like to put the manipulation in the context towards the benefit of improved movement. With the surface electromyography (SEMG) assessment of paraspinal muscle function, it has been suggested that articular mechanoreceptors and muscle spindles are activated during the spinal manipulation. The resulting increase in mechanoreceptor activity is thought to result in reflex inhibition of spastic muscles in the affected area. This increased sensory input is also believed to result in reduced transmission of nociceptive signals, resulting in decreased pain perception (4). Evidence also suggests that removal of deleterious or abnormal afferent input at the site of articulation alone may result in improved proprioception and motor response (5). Therefore, with the removal of aberrant afferent information via the manipulation, the pelvis and surrounding musculature would be able to function better. If you coupled the manipulation with some sort of motor skill acquisition, then the short term responses will eventually become long term improvements in overall movement. Results from mechanical and neurophysiologic studies may thus be interpreted as if joint manipulation has both direct and indirect clinical benefits. The effect of spinal manipulation on various kinematic parameters of spine, pelvis, and hip motion has been shown to be beneficial. High velocity low amplitude manipulation is a mechanical intervention, it is inherently rational to assume that the mechanisms for the therapeutic effect may lie in the mechanical properties of the applied force, the body’s response to the force, and the movement caused by the force, or an amalgamation of these and other factors. From a neurophysiologic point of view, the existence of mechano sensitive afferents in spinal tissues and the role of afferent stimulation in coordinated neuromuscular stabilization of the spine provide a plausible model for investigations of the mechanisms for the clinical effect of HVLA manipulation (6). With benefits like this, why wouldn’t you want to use this modality with your patients and athletes. It creates inherent kinesthetic awareness which is advantageous for an athlete in their sport or for surviving life in general. I use multiple movement systems, biomechanical theories, and tests to conclude if and what I will manipulate. For Example, when I assess the prone hip extension, I will typically use the Janda Hip Extension Test. Early activation of the spinal erector and hamstrings muscles and decreased or delayed activation of the gluteal muscles has been interpreted as an indication of faulty muscle activation (7). 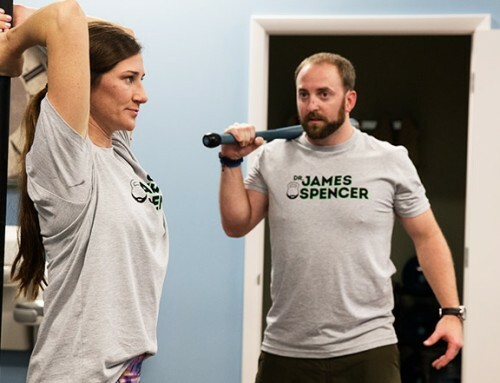 Janda emphasized the faulty movement pattern associated with prone leg extension is early lumbar extension, rather than emphasizing the firing order. Unfortunately, many have misinterpreted the clinical application of Janda’s research, resulting in controversy (8). This test is beneficial more for clinical use when you consistently see apparent overuse of the lumbar erectors. This is something that I see very often in my patients and athletes coupled with an anterior pelvic tilt. I use these tools to test and re-test so that I can tangibly see the change and my clients and athletes can feel the change. I’m extremely attracted to the osseous manipulation because of the biomechanical, neurological and physiological changes that occur post manipulation. Joint neurology is so awesome! When we compare this athlete’s prone hip extension on the left and the right, I want you to use several points in the background (perform better book bag and the Philips box) as frames of reference to see the pre and post changes in his left hip extension after the manipulation is administered. The improved range of motion should be followed up with some motor skill acquisition or a training session. This will help solidify improved movement for long term change. With my formal training as a Sports Performance Chiropractor and Athletic Trainer, I’ve seen some astonishing improvements with pain, joint proprioception and overall movement due to chiropractic spinal manipulation. I personally use this modality for pain, joint mechanics and improved movement. As I’ve stated in some of my previous articles right here on DrJohnRusin.com, the Chiropractic Manipulation would be my “Reset” in Gray Cook’s Theory of Reset, Reinforce, Reload. When a chiropractic spinal manipulation is administered, typically tangible changes are pretty immediate. However, I have seen the changes take several days, depending on the dysfunction or injury. Some concerns that I have with the spinal manipulation is the overutilization of the modality when it’s the only tool you have. I got some great advice early on in my career from some movement mentors stating don’t bring spinal manipulation into a non manipulation case… meaning not every single person needs this intervention. Remember, continue to learn new things and help others! Mintken PE, et al. A Model for Standardizing Manipulation Terminology in Physical Therapy Practice. J Orthop Sports Phys Ther 2008;38(3):A1-A6. Kent C. Surface electromyography in the assessment of changes in paraspinal muscle activity associated with vertebral subluxation: A Review .J Verebral Sublux Res. 1997;1(3):15. Palmgren Per J, Andreasson D., Eriksson M. and Hagglund A. Cervicocephalic kinesthetic sensibility and postural balance in patients with nontraumatic chronic neck pain- a pilot study. Chiropractic and Osteopathy. 2009; 17:6. Sandell J, Palmgren PJ, Bjorndahl L. Effect of chiropractic treatment on hip extension ability and running velocity among young male running athletes. Journal of Chiropractic Medicine 2008 Jun;7(2):39-47. Lewis C., Sahrmann S. Muscle Activation and Movement Patterns During Prone Hip Extension Exercise in Women. J of Athletic Training. 2009;44(3):238-248.